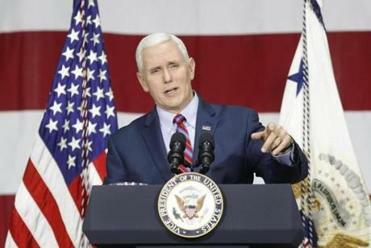 Vice President Mike Pence addressed supporters last week during a visit to discuss health care at a roundtable at Tendon Manufacturing in Bedford, Ohio. ON THE EVIDENCE of a lifetime, America’s vice president is not a complex man. Instead he is three extremely simple ones: an incompetent ideologue, an obsequious toady, and a self-serving schemer. When Donald Trump selected Indiana’s governor to run with him, local observers were dumbfounded. They knew Pence as a comically ambitious, rigid, and inept right-wing evangelical — a climate-change denying, Darwin-doubting zealot who, before leaving Congress, had left no mark beyond his sulfurous opposition to reproductive and gay rights. And his accession to the governorship, meant to position him as presidential timber, had foundered on the fundamentalist verities that define his mental cul-de-sac. A signal embarrassment was his embrace of a “religious freedom” bill designed to propitiate business owners who wished to discriminate against gays. This antagonized the state’s business community at large, a setback exponentially amplified when, interrogated by George Stephanopoulos, Pence issued a tongue-tied nonresponse so mortifying that it rewards a look on YouTube. Shouldering Pence aside, the legislature reached a compromise to salvage Indiana’s reputation. Facing electoral doom, this ostentatious Christian — who calls his wife “Mother” and refuses to be alone with another woman — prostrated himself to become Trump’s running mate, the bridge between evangelicals and a blatant libertine. Trump, not Jesus, became Pence’s personal savior: Cravenly, Pence proclaimed Trump a model paterfamilias and man of deep faith. To cognoscenti, the reflexive alacrity with which Pence swathed Trump in pieties confirmed a surreal obliviousness to his own moral smallness. Even so, he swiftly elevated serial hypocrisy to unforeseen heights. A quarter-century later after his beginnings as a talk show host, Mike Pence remains as small as his beginnings. Read: Is this what Mike Pence wanted all along? Less so Pence. Belatedly perceiving that Trump’s misogyny had provoked mass revulsion, he canceled a campaign appearance before vanishing altogether, after saying that he could not “condone [ Trump’s] remarks” — true moral leadership, that — but that “ we . . . look forward to the opportunities he has to show what is in his heart” in the debate the following night. That Pence was angling to displace the gravely wounded Trump was painfully obvious — not least to Trump, who attacked “self-righteous hypocrites . . . more concerned with their political future.” When Trump survived the debate, Pence wallowed in renewed self-abasement. “Proud to stand with you,” Pence tweeted, and grabbed Trump’s coattails once again. His next oscillation came in the vice presidential debate. Resigned to second place, Pence began positioning himself for 2020, turning in a robotic appearance, heavy on right-wing talking points but exceedingly light on praise of Trump. Indeed, Pence contradicted Trump on Syria, Vladimir Putin, and how to deal with Russia — overtly courting the Republican right. Little wonder that Trump expressed private discontent with his underling’s performance, which exposed the calculus of a climber who expected Trump to lose. Instantly, Pence reverted to fawning puppet — even by the standards of vice presidents. Joe Biden supported Barack Obama without ever losing his dignity or integrity; Pence had neither. Miming a servile staffer — Trump’s preferred mode of behavior for his underlings — Pence parroted Trump’s moronic talking points and outright lies, nodding and smiling as Trump spouted self-contradicting nonsense. By all reports, he never complained when Trump concealed his knowledge of Mike Flynn’s lies to the FBI about Russia, allowing Pence to repeat them on talk shows. Nor did he bridle when Trump dispatched him to advance the pretext that James Comey was fired on Rod Rosenstein’s recommendation, then revealed his actual purpose — to kill the FBI’s Russia investigation. It was utterly in character, then, when Pence kicked off the most excruciating display of synchronized sycophancy in memory — the chorus of praise from cabinet members upon their first meeting with America’s Dear Leader. “The greatest privilege of my life,” Pence intoned in his church organ voice, “is to serve as vice president to the president who’s keeping his word to the American people.” Sadly, perhaps it is. But the palace contriver ever searches for vacuums. Because Trump knew no one in Washington, Pence curried favor with the right by helping seed the cabinet with conservative ideologues. And as questions about Trump’s survival burgeoned anew, Pence launched his own political action committee while cultivating restive legislators. Who is Mike Pence? Take your pick of three. But one thing is clear — none of his personae are fit to be president.